This week’s news cycle reported something I found alarming. 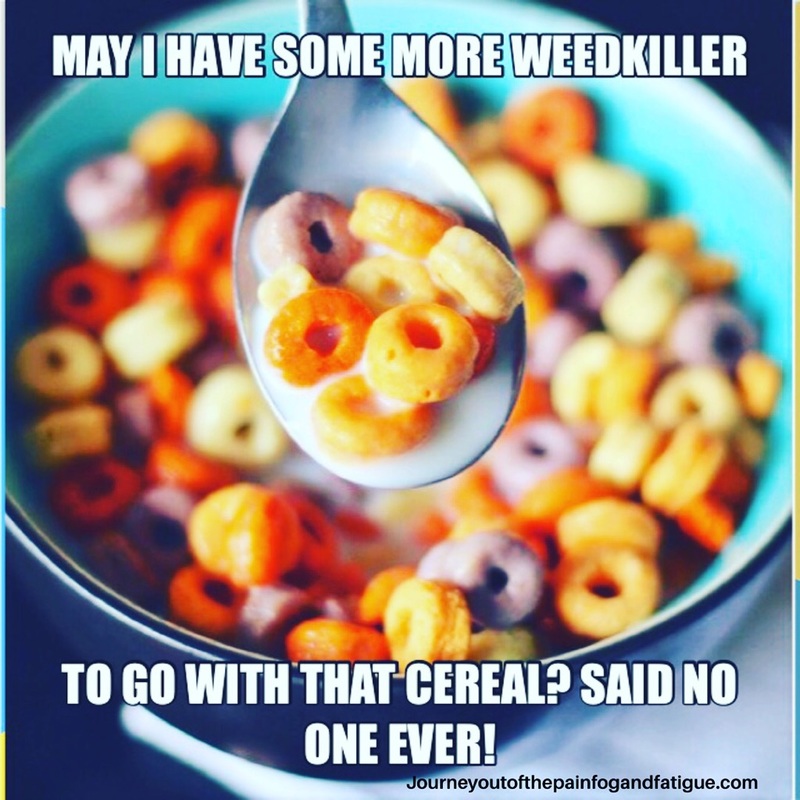 A recent study found high levels of the weedkilling chemical glyphosate, commonly known as RoundUp, in many popular breakfast cereals, oats, and snack bars marketed by industry giants Quaker, Kellogg’s, and General Mills. They found that three in four products considered safe for children to consume, had high levels of this weed killer (Milman 2018). The nonprofit Environmental Working Group was commissioned to test these products after an investigative journalist working for the nonprofit U.S., Right to Know, obtained internal FDA emails that the agency had found glyphosate in wheat, corn and oat groups, but had not yet released it to the public (Goodman, 2018). Umm…what…the absolute…FLIP?! 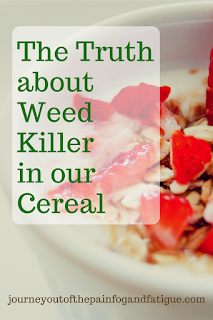 So, I researched more in depth about what this weed killer has been doing since its introduction in 1974, what it does to the body, and how I began to connect the dots with many of the issues that I experienced with gluten, which has often led to inflammation, kidney pain, irritable bowel syndrome, low levels of Vit D, thyroid problems, and constipation. 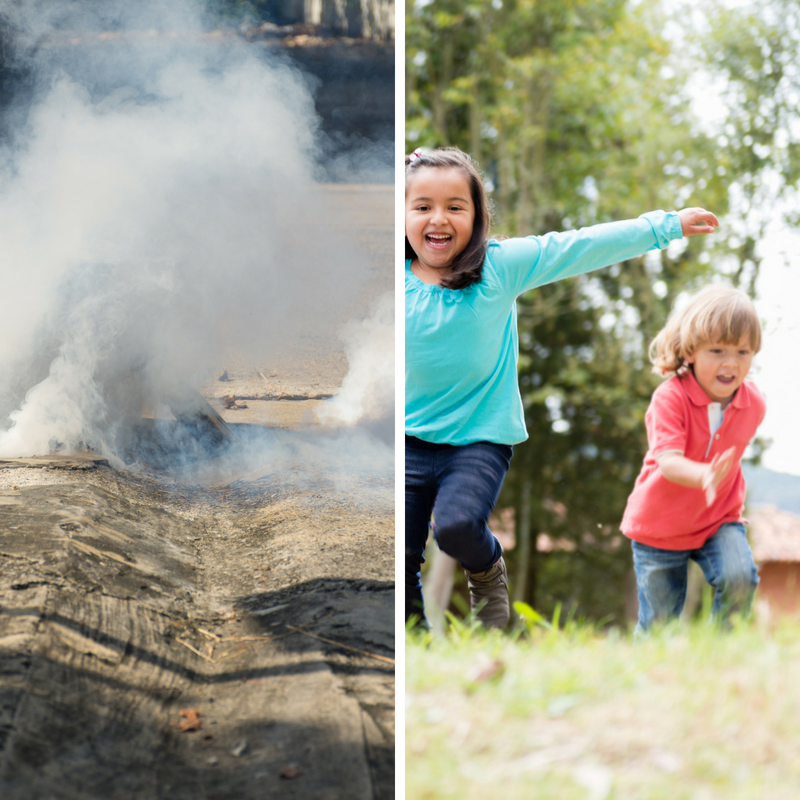 about the dangers of DDT in our food. I didn’t know much about DDT back then, other than it was a pesticide that was bad, and there was word on the street, yes, this was back in the day when we gossiped face-to-face, that this poison was being linked to cancer, sterility and many other health problems. I grew up in a border town, along the coast and near citrus farms, and I can still remember the vehicle workers that would travel down our street spraying the stuff during mosquito season. That stuff smelled so bad, I remember my biological mother screaming at us to make our way back inside our small, two-bedroom housing apartment. Eventually DDT was banned, and glyphosate was supposed to be the saving grace that was going to resolve this issue to help phase out the more dangerous herbicides. It seemed to work, at first, but a gradual shift began to take place about its effectiveness. In 1994 7.4 million pounds of Roundup was used for agricultural products (Reed, 2015). Today, when 200 million pounds of it is sprayed each year on corn, soybeans, wheat, oats, and used on produce such as spinach and almonds (Milman, 2018), that’s enough to raise more than a few eyebrows. But why is this happening? An article published in researchgate.net, titled Superweeds, attributed that increase to crops becoming more and more resistant to this weed killer, so farmers kept increasing the amount of herbicide on these plants. Hence, it managed to also make its way onto our kitchen table…and… we’re consuming it. Today, most food heavily contaminated with glyphosate are oats, especially those conventionally grown; organic oats have the lowest levels (Goodman, 2018). Which makes sense, since glyphosate is banned from use in organic farming, but it should be noted that the presence of contamination is still there if they are next to a field that uses conventional methods. 2013- This is a much older study, but worthy to note, considering the connections that glyphosate has with celiac disease. Titled, “Glyphosate, pathways to modern diseases II: Celiac sprue and gluten intolerance,” this study summarized the growing problem in North America and Europe with celiac disease and other issues that surfaced in various animals. Fish exposed to glyphosate, for example, developed digestive problems. They found that glyphosate also inhibited the binding of important minerals and found a few links between selenium deficiency and autoimmune thyroid disease. The surge of kidney failure among agricultural workers in Central America who worked with glyphosate was highlighted. Also included was evidence of disruption of gut bacteria in poultry, cattle and swine. The study showed evidence of important bacteria, that aids in the breakdown of wheat and alleviates symptoms associated with celiac disease, missing in the gut bacteria of animals that consumed glyphosate as well. Decreased levels of certain enzymes that aid the liver was also referenced. 2015- According to consumersaftey.org the World Health organization classified glyphosate as “probably carcinogenic in humans,” but noted that there was limited evidence linking it to non-Hodgkin lymphoma. 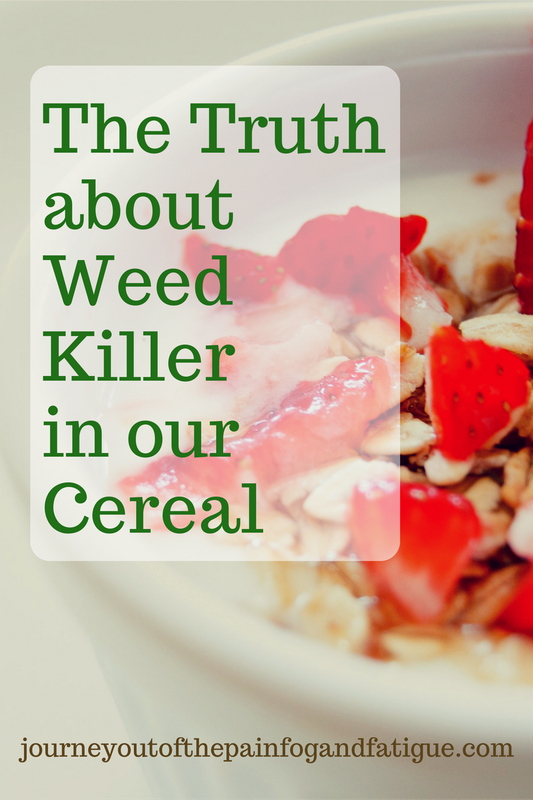 Labeling it carcinogenic may be due to the cancerous tumors found in rats, while other lab studies showed that this weed killer can damage DNA in human cells when exposed to it (Reed, 2015). Europe is making efforts to ban it and Germany will stop using it in 2021 (Goodman, 2018). 2016- Consumersafety.org further reported that a study funded by Monsanto found no evidence for a causal association between glyphosate and non-Hodgkin lymphoma or multiple myeloma. Yet, the site also noted that a California jury recently awarded a groundskeeper suffering from non-Hodgkin’s lymphoma $289 million in compensatory and punitive damages from exposure to Monsanto’s product. Monsanto plans to appeal, however, since their study did not find a causal link to cancer. 2018- Although the Environmental Working Group found high levels of glyphosate in the foods mentioned in the introduction of this post, they also concluded that a single serving of most of the food would cause just one additional case of cancer in every million people (Goodman, 2018). Hold it… here’s the problem that I have with this last study mentioned, but first, allow me to ask an honest question here: How many of you actually follow the recommended serving requirements in the food packages? I mean seriously, have you ever been to a party or some type of celebration and only had a sliver of cake, or just one cookie, a half a slice of pizza, or less than seven chips? Do you have kids? Have you seen how much kids can eat when they’re at a party? I stop to think of how much food I used to be able to eat when I was a sprouting teenager, and I give myself heartburn just thinking about it. These industries are money-making industries for a reason, because they make products that taste pretty freaking amazing, and you can’t simply have just one bite. Add to that the population of emotional over eaters, prone to genetic mutations, and it doesn’t really take a chemical scientist to reason that as a nation, we are consuming more than a single serving of that poison and not making ourselves sick. But what exactly does this glyphosate/RoundUp/ weed killer, do? Glyphosate was first introduced in 1974, and it works by blocking an enzyme that’s only made by plants and originally thought to be inactive in the human body and non-existent in animals; bacteria, however, does contain this enzyme (Goodman 2018). In fact, it works so well, Monsanto patented this stuff as an antimicrobial in 2010, but showed to disrupt gut bacteria in animals, potentially causing pathogenic overgrowth (Samsel &Senoff 2013). Which leads me to question what effect this has on good bacteria, especially the type of bacteria our body needs? An article titled Roundup Chemical in Your Cereal: What to Know, found that our bodies contain about 100 times more bacteria DNA than human DNA. If glyphosate is damaging our DNA, then it may be the most harmful to the good type of bacteria that helps dampen inflammation in the body. They admitted that this was a theory, granted, but one that tends to make so much sense to me as well, considering that once I got off the gluten, I felt a tremendous improvement with less inflammation and stomach upset. If our bodies are made to fight poisons due to the good bacteria found in our DNA, what are the implications of being able to fight those poisons when our DNA is changing, or good bacteria is being wiped out? Think of the amount of vaccinations we are dosing our kids with today, for example. If children don’t have the bacteria or immunity necessary to battle the ingredients that we are injecting them with, what is that going to do to their beautiful developing minds and bodies? Now, before I get the pro-Vaxxers, ready to burn me at the stake, you should know that I’m not an anti-vaccine person, but I am considerably and genuinely concerned about what we are doing to children with lower immunity, whose gut flora is being wiped out in the process, due to certain genetic predispositions that keep them from detoxifying their bodies, especially if they’re consuming high levels of glyphosate from food. Then here we go give them several doses of these vaccines without question, because of this one-size-fits-all, the government knows what it’s doing, attitude. Stop. Poisoning. Our Kids. PERIOD! Olga Naidenko, PhD., the senior science advisor for children’s environmental health, stated that glyphosate shouldn’t be in food used to feed young children (Goodman 2018), and I couldn’t agree more. But in the meantime, what can we do to lessen the amount we’re consuming of this poison? I wish you well on your journey to healing if you’re suffering from painful inflammation. If you know anyone going through something similar, share this post and help spread awareness. Till next time!